As a Charlotte Mason educator, nature study is a big part of our homeschooling and that includes free time for the children to explore, discover and observe on their own. It was during these times that my oldest son feel in love with snakes, despise my fear of them. It was from his love of snakes that I learned that importance of knowledge and being able to identify snakes in your area and the following tips are what we use in our own family. 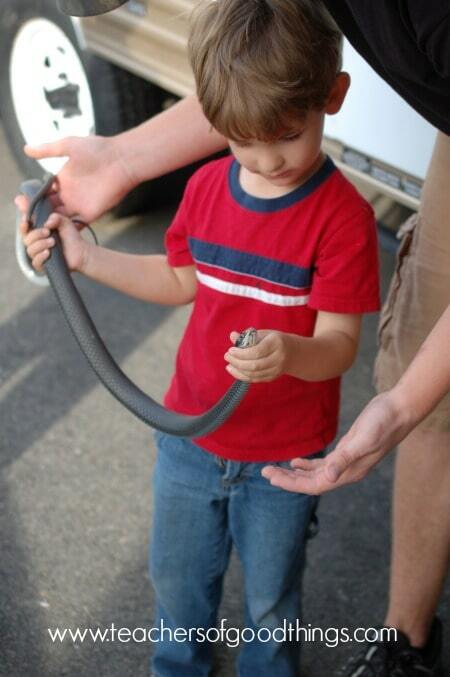 When my first son was about five years old, he became very interested in snakes. At the age of eighteen that hasn't changed. For a mommy of a young boy who goes looking for snakes under rocks, it can be a very scary thing. I realized then that knowledge is power. I contacted the Virginia Department of Game and Inland Fishery. I talked to them about how I could find out about the snakes in our area, specifically the venomous snakes. 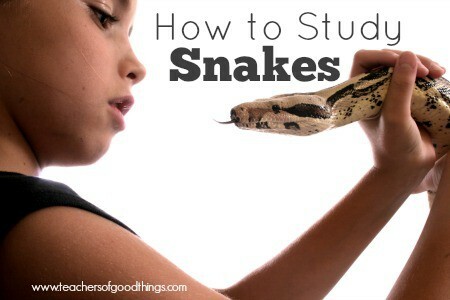 When they heard that I homeschooled, they sent each of my children their own handbook of snakes from Virginia. This has been a great resource. Each page had one snake and at the top it was green if they were non-venomous and red if they were venomous. This was perfect for a non-reading snake lover. That year for school, I required him to read that book again and again, being sure he knew how to identify these snakes. Imagine my joy when just a few years later, he was able to correctly identify a snake before an animal control man could and was able to tell the volunteer at a local museum more about the snake on display than he knew. When this journey first started for us, I was not liking it at all. However, when my son began to educate me on the diet that different snakes have and seeing how beneficial it would be to have certain snakes living around the outside of our home, I soon learned how to tolerate them. 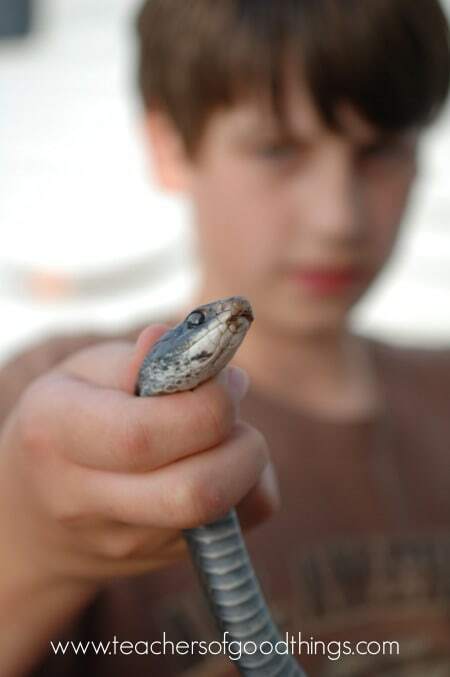 We have always had cooper heads on our property and for a mom of a snake lover, the stress involved with him seeking out these creatures is difficult to handle. However, when he told me that some snakes eat cooper heads, I was intrigued! So now when I see a Black Racer or a Rat Snake slithering across my yard (at a good distance) or find the many molts of their skins laying around our property, I smile because I know that not only are they keeping the cooper heads away from my children and my dog, they are doing their best to keep any rodents from entering my house. Part of learning about a snake is knowing their nature habitat, especially with venomous snakes. You will want to be aware of your surrounding when walking in woods, high grass, rocky areas and such, as well as what venomous snakes habit that area. Rather your children go looking for snakes or just enjoy learning about them through books or online, I would encourage you to give them journals to enter their learning, facts and improve their skill of drawing. 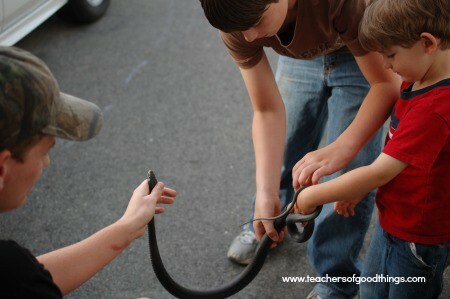 These are some of the best ways we have enjoyed (or tolerated) learning about snakes. Boy, I have a list of stories that I could share about the nature studies that my children have had, the frights that have resulted from them and the humor that still lingers, but then I would have to change the title of the post.